As you can tell I went on a bit of a Tree House kick a while back as I had a couple people that went and traded me a bunch of Tree House cans. I should make the trip to Monson more often than I do but it is a long boring drive from Western Maine and I don’t have many customers in that area, yet. Hopefully that will change soon and I can visit the guys and gals at Tree House more often. In the meantime if you make the trip and end up with extras let me know as I am sure we can work out a trade. Haze looks very similar to the other Tree House beers with the murky orange and substantial off white head. Aroma is less citrusy than most with more tropical and peach than the others from Tree House but still very pungent and enjoyable. Flavor follows but adds a significant resiny pine character that is not in the nose. Finish has more bitterness than Juice Machine or some of the others but still relatively low compared to many IPA/DIPAs. Carbonation is typical Tree House low on the scale but enough to help keep the head and aroma coming. 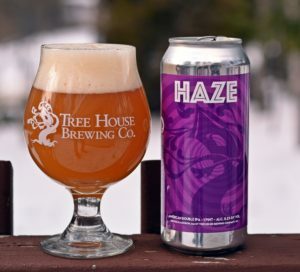 Another superb beer from Tree House, if you enjoy hops you must try their beer as they are certainly in the top 5 breweries when it comes to hop forward beers. Brewer’s Description: We constructed this beer around hops we currently have plenty of access to, allowing us to re-brew it on a (relatively) consistent basis. We smell a ton of orange on the nose, with complimentary notes of peach and passionfruit. The flavor is similar with a blast of citrus fruit & orange quickly followed by spicy grapefruit, and earthy dankness. A lingering but pleasant hop oil finish awaits.